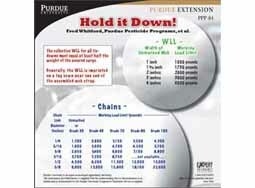 This laminated pocket guide lists the working load limits for chains, webs, and ropes. It also shows the right number of tie-downs for safely securing loads. Small enough to carry it in your pocket or put it in your glove compartment as a quick reference the next time you send out a load.